The Magnasonic Alarm Clock Radio uses a swiveling arm that can project the time on a ceiling or wall and the focus can be fine tuned. Time's on your side — and ceiling. Am I the only one whose cell phone alarm clock frequently and inexplicably cancels the set alarm? Hotel wake-up calls don't always happen, either, and I may or may not set the room alarm clock correctly. That's why I travel with my own little alarm clock — and I've just discovered a doozy. The new Alarm Clock Radio from Magnasonic has a swiveling arm that, when activated, projects the time in bright red LED numerals on the ceiling or wall — a bonus for middle-of-the-night wakers like me. A focus wheel lets you get the beamed numbers sharp and clear. 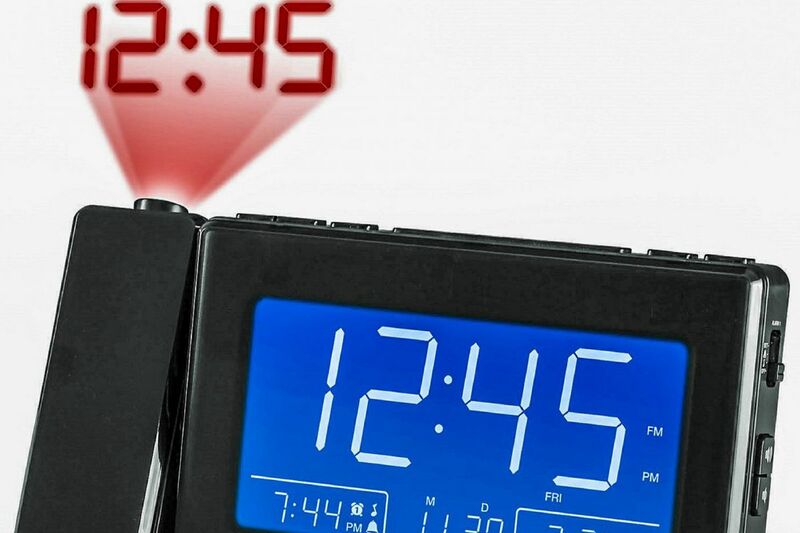 The alarm clock also has a USB port for charging your cell phone or other device, as well as a 3.5mm auxiliary jack for connecting a headphone. Setting the clock is a breeze — you just set your time zone using the little cheat sheet sticker on the clock, and the correct time is displayed, automatically adjusting for Daylight Savings Time. Dual alarms let you and your companion each choose a wake-up time and whether you want a buzz or a selection of preset radio stations to get your eyes open. You can also cycle through a calendar and inside temperature display. The projection beam runs on a replaceable included 3-volt lithium battery, which also provides battery backup should the power go out. Did I mention the display can be set to automatically adjusts brightness for daylight and night viewing? The clock radio weighs in at barely a pound even with all those goodies built into its 2.9-inch by 7.5-inch by 4.1-inch frame. Magnasonic Alarm Clock Radio with Time Projection is $34.99 in black or white at www/magnasonic.com.